According to Wikipedia, “Holliston is a New England town in Middlesex County, Massachusetts, United States in the Greater Boston area. The population was 13,547 at the 2010 census. It is part of the Massachusetts region, located due west of Boston, that is known as the MetroWest. Holliston is the only town in Middlesex County that borders both Norfolk and Worcester counties.” It’s also the setting for, originally, the life and times of Adam Green, horror movie aficionado and writing talent behind Hatchett 1, 2, & 3, Frozen (but not the one your kids like…), and Digging up the Marrow. 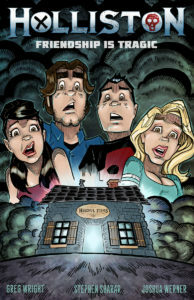 More recently, Holliston serves as the setting, based on the aforementioned “life and times”, of the ill-fated but exceedingly popular sitcom Holliston (seasons 1 & 2 available now on Amazon!). 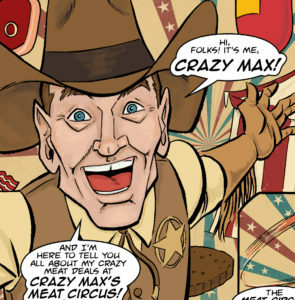 Even more recently than that, the town is the ongoing setting for the new comic book series from Source Point Press, you guessed it, also named Holliston. The inaugural issue of the comic finds the two friends and roomies coming to grips with their lack of funds, heading into their most magical time of the year- Halloween. Hijinks ensue when Adam finds a pre-paid gift card containing copious amounts of pre-paid cash. Joe is less than enthusiastic given that the card, along with the conveniently placed receipt to back up the card’s status as “loaded”, was found underneath the carcass of a dead black cat. As you all know, anything found beneath the carcass of a dead black cat can only be cursed, therefore Joe urges Adam to get rid of the thing. Seeing as the comic is based on a sitcom, Adam does not get rid of the card. Instead, he takes it directly to a suspiciously named shop called “Needful Items”, which he just as suspiciously has no memory of existing there, in his hometown, before. Cue hilarity and said hijinks. 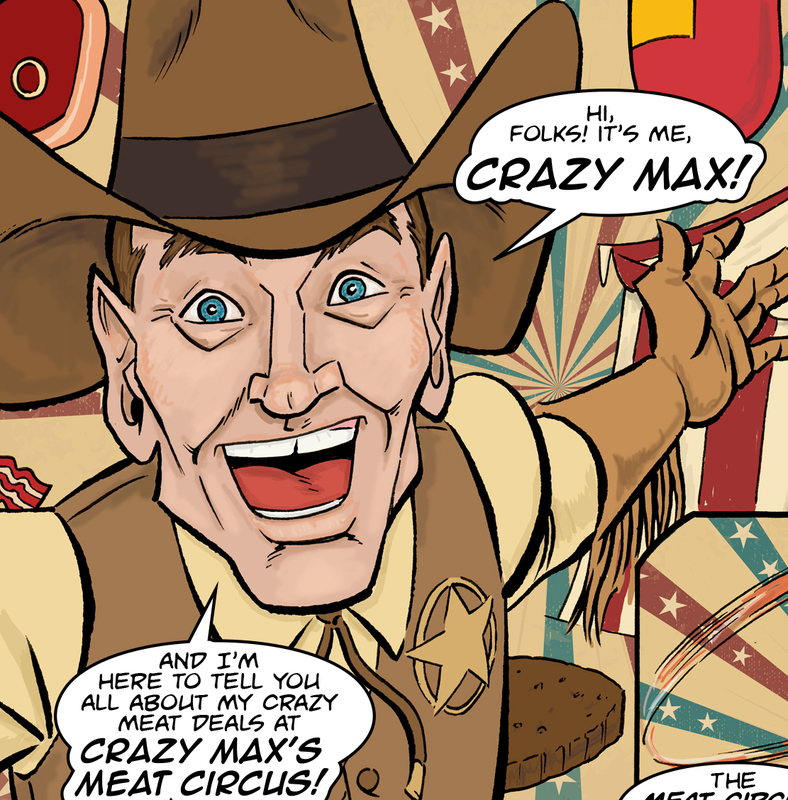 First and foremost, Holliston the comic is a labor of love. What started out as a concept and grew into a phenomenon with a rabid following has now come to Source Point, home of some damn fine comics if I say so my damn self. The fact that Adam Green was extremely hesitant, as stated in his forward, is evidence of his reluctance to let his baby out into the world without him. Fear not, by all counts it looks like Holliston is in the caring hands of some top notch talent. With writing duties taken on by Greg Wright, the tone of the television series is recreated with love and tenderness. Adam and Joe remain oddball besties, while Corri and Laurie are firmly entrenched as the more or less “straight men” to the boys’ immature banter. What’s more, thanks to this being a comic book, where the limits are only based on what can be contained within a set of pages, things like budgetary constraints are right out the window. This is where the visual imaginings of Stephen Sharar come into play, and play he does… If you think you have a handle on what kind of chaos can come from a cursed cash card being spent at a shop called “Needful Items”, you’re probably wrong. Unless you’re just that twisted, in which case you might be right. I won’t judge. So, fans of the beloved television show, rejoice! Once again, the sick and perverse minds of Adam and Joe are brought out to bring every horror movie pop-culture related joke into the light. As someone who hadn’t seen the show until I was given this bizarre issue to read, at which point I may have done some binging on YouTube, it seems that what was great about Green’s brainchild is intact. Source Point, you guys have done it again! But wait! There’s more! 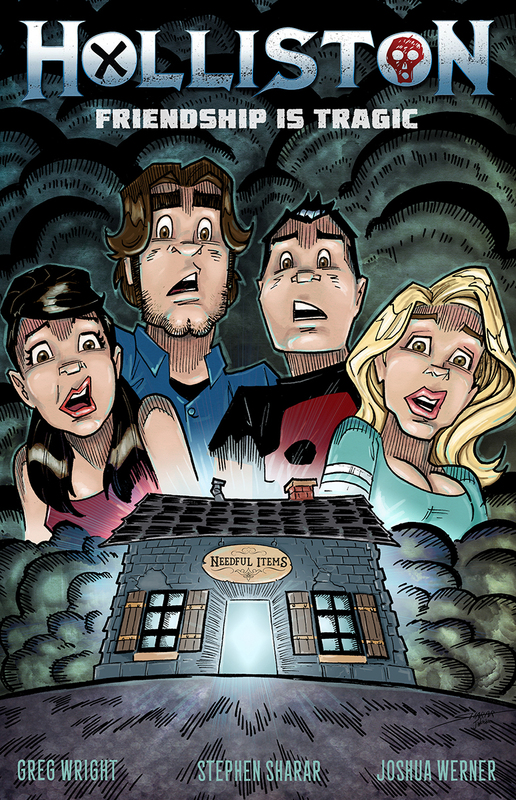 It’s been recently announced that Holliston the TV show is back in development, so keep your eyes peeled for updates. Good things come to those who wait… unless you’re still waiting for more episodes of Firefly. That ship has sailed.